It was a good performance. I thought our first period was good. I thought our penalty kill was good, as well. It was good to see some guys reach some milestones. Those are big achievements – 300 goals and 300 wins are big and hard to get in this league, so it was good to see that. Brownie, too – his longevity. He’s been a good player for us. Well, I think it is a team. He’s a really hard guy to hold down. I think it starts with Quickie with the big saves. I think as a group we did a pretty good job. Like, we’ve been able to keep him to the outside, but he’s just an explosive player and he can capitalize at any time. It’s funny, we thought even against Tampa Bay, I thought our start was good. Our first six minutes were really good. We didn’t score, but we had three or four chances. Vegas, we had a good start too, but just didn’t capitalize. Tonight they went in for us. The third one was a big one. They were starting to pinch, and Carter turned that one – it was a big goal. Cliffy was out, he came back in taking that first one to the net. We had good performances all around, but we have had pretty good starts. Yeah, the year probably hasn’t gone quite like they wanted it, but they’ve been scoring of late. They’ve been getting a little bit more and more looks, so it’s good. It’s good for us as a group. You know, it feels pretty good. I was hoping it was going to come a little earlier than that, but hey, it’s here and I’m pretty proud of that. Yeah, I mean it’s got to be up there. I think obviously after the last two games we knew that we’ve got to stop the bleeding again and stop it quick, so I thought our first period today was intense, with purpose, and it showed on the scoreboard essentially. Actually, I didn’t realize it until the very end when the trainers told me to go grab the puck. But yeah, it’s special. It’s great for Quickie obviously, and in my mind he’s the best goalie in the world, and it’s very comforting to have him back there and a privilege to play in front of him. Anytime you take penalties, and especially five-on-three, it can get ugly in a hurry just like it did the last game. Tonight we took some penalties, but we were able to kill them off and help him out in that regard. Yeah, I did. That was probably the last time I had a six pack. [Reporter: Any of the guys giving you grief about that?] Well, that was the first time they saw it, and quite frankly my second time seeing it, so I’m sure it’s going to be all over social media eventually. [Reporter: If it isn’t already, right?] I’m sure it is. I mean, obviously first and foremost we got two points against a division team and a team we’re chasing in the standings, so we were able to get that tonight. And as far as 300 wins, it’s just as a group of guys I’m lucky enough to play with for the last eleven years or whatever it is, it’s been awhile, and hopefully we keep going. You know, we want to win some more games and for Kopi that was awesome. Was it 300 goals? That’s what it was? Yeah, he’s more of a play-maker than a goal-scorer, so 300 goals, that’s a lot, so that’s impressive and I’m happy for him. I mean, 97 over there, we were able to limit his opportunities. He’s pretty amazing, so to limit his opportunities and that line in general and just the way we played through the neutral zone and into our zone, and it was a great, great game. But like I said earlier, this is two points and now we move on. We’ve got another game, we go to San Jose, so there’s another division game, another team we’re chasing. Got to get ready for that game now. We’ve got a great equipment staff so they were able to get a new cage on, so next whistle I had my helmet ready to go. Yeah, no, we’ve obviously been through a lot, ups and downs, so at the end of the day, I’m sure you could ask him if he felt the same way, but it’s just we were able to win a game tonight and we’re just trying to win another one in a couple of days here, so that’s the approach. I mean it’s tough to kind of look at in the moment. In the moment you’re trying to get back towards the playoffs here, so that’s all the focus is. Obviously all that extra stuff is cool and all, but at the end of the day it doesn’t mean much unless you’re playing for the Cup and that’s what we want to do. –With the win, Los Angeles improved to 86-86-39 all-time against Edmonton, a record that includes a home mark of 47-37-21. 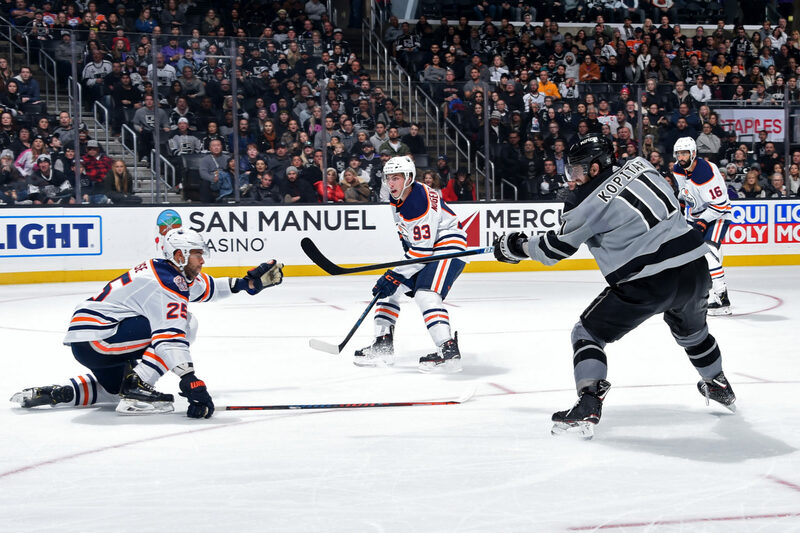 The Kings are 14-1-0 in their last 15 home games against the Oilers and have averaged 4.82 goals per game over their last 11 match-ups at Staples Center. These teams have one game remaining, March 26 at Rogers Place. –With the win, Los Angeles improved to 12-13-1 against the Western Conference, 8-7-1 against the Pacific Division, 7-13 in games decided by three or more goals, 13-3-1 when scoring first, 6-0-0 when leading after the first period, 12-1-1 when leading after the second period and 6-8-1 when outshooting their opponent. –The 16 shots allowed represented a season-low. The last time the Kings allowed 16 shots or fewer was a 2-1 home loss to the Coyotes on April 2, 2017 in which they out-shot Arizona, 35-15. –Jonathan Quick won his 300th career NHL game tonight, becoming the 17th goaltender in NHL history to do so before playing 600 games. He is the second fastest American to reach the 300-win plateau – Ryan Miller did so in 566 games – and 11th fastest overall. Quick is the franchise leader in games played, wins, save percentage, goals-against average and shutouts. By stopping all 16 shots he faced, he earned his 51st career shutout, moving into a tie with Curtis Joseph, Rogie Vachon, Tomáš Vokoun and Dave Kerr for 25th place on the all-time list. –Anze Kopitar scored his 300th career NHL goal, becoming the fifth King to reach the 300 goal mark (Luc Robitaille: 557; Marcel Dionne: 550; Dave Taylor: 431; Bernie Nicholls: 327). He has registered exactly one point in 10 of the last 13 games (3-7=10), with his last multi-point outings coming on three consecutive nights on November 25, 27 and 29. –Drew Doughty (0-2=2) registered his fourth multi-point game of the season. He has points in each of the last two games (1-2=3) and eight points in the last 10 games (2-6=8). –Kyle Clifford (1-0=1) registered his sixth goal of the year in his 33rd game, one shy of his career-high (twice, 2012-13 and 2010-11). –Anze Kopitar earned 18:46 of ice time, ending a stretch of 25 consecutive games in which he earned at least 20 minutes. –Los Angeles attempted 39 shots (23 on goal, 8 blocked, 8 missed). Edmonton attempted 43 shots (16 on goal, 15 blocked, 12 missed). Jeff Carter and Connor McDavid tied with a game-high four shots on goal. Only nine of 18 Oilers skaters registered a shot on goal. –The Kings won 31-of-53 faceoffs (58%). Adrian Kempe won 3-of-7, Anze Kopitar won 14-of-24, Ilya Kovalchuk won 1-of-1, Nate Thompson won 5-of-9, Tyler Toffoli won 0-of-1 and Jeff Carter won 8-of-11. The Kings are scheduled to practice at 11:00 a.m. Sundayb at Toyota Sports Center.